Adam’s Restaurant 50 S. Main, (707) 456- 9226. D Tu-Sun; $$$. Reservations recommended. The most upscale dining spot in town, this tiny spot features an intimate dining room plus a few more private tables in an upstairs loft. When the weather is nice, an outside patio under Japanese maples and plum trees--shared with the pub next door--is a good choice. Because the space is small and the staff is small, so is the regularly changing menu small. Choices might include a variety of raviolis, filled perhaps with Dungeness crab, or artichokes, or wild hand-picked local porcini and chanterelle mushrooms. Steak and fresh fish are usually options as well. Endings might include a milk chocolate mousse in a martini glass and perhaps several kinds of crème Brule. Shanachie Pub 50 S. Main St., (707) 459-9194. No cards. Just next door, this popular pub serves no food available but welcomes you to bring in outside food or even have it delivered. There is always a wonderful selection of Mendocino County beer, and local musicians often play here. Hotel Zeppelin San Francisco 545 Post St., 2 blks. from Union Square. 196 rooms; 8 stories. Restaurant; room service (24 hrs.). Fitness room. Valet parking $56. Pets ok. Built in the early 1800s, this post-Gold Rush building first became a hotel in 1918. With a vibe that gives a nod to the 1960s--most rooms feature a Fillmore poster on the wall, suites have their own vintage record player and records (other rooms can borrow one by request)--this hotel appeals especially to both young and mature hipsters. The hotel is made up of two towers. The basement level is used for meetings but also acts as a big adult game and rumpus room. Partitions are made from recycled glass, and a pool table and Bingo table/DJ station are among the facilities. Art is woven into the spaces--for instance, in the “Love” room a recycled red VW bug has been converted into a coffee table--and an outdoor deck space is also available. These spaces get lively in the evening when people bring down their drinks. Bright red bikes that are custom made for the hotel--they change gears automatically--are available for loan. The hotel’s edgy grey-black-purple decor includes wallpaper featuring the names of rock bands; it is lightened by guest rooms featuring all-cotton white sheets and duvets. The contemporary bohemian-style Zeppelin Suite/Presidential Suite is a full apartment equipped with a private outdoor patio landscaped with a living wall and wired for music. Off the lobby, the fireside Zeppelin Cafe is open all day for snacks. It serves local goodies such as Sightglass Coffee, Jane pastries, and Dynamo Donuts. At 5 p.m. it transitions into a bar, and sometimes live music or perhaps a book reading is scheduled. The cafe features both an original brick fireplace and black-light graffiti art on the walls. A more formal restaurant and bar are coming and will feature a special entrance for guests inside the hotel. It will offer pizzas made in the original Postrio pizza oven (a previous restaurant here that was owned by Wolfgang Puck). Also, advance arrangements can be made to stock the room refrigerator. Foot of Laurel St., Fort Bragg, (707) 964-6371. Daily; schedule varies. $25, 3-11 $15, infants and dogs $10/$10. Reservations advised. The Skunk Train was founded here in 1885 as a division of the Union Lumber Company. The tracks are standard gauge, 4’ 8½”. The line was extended east to harvest trees for milling and arrived in Willits in 1911. The railroad took 26 years to build and was once used to deliver mail along the way. The train gets its name from the fact that the original logging trains emitted unpleasant odors from their gasoline engines. Loggers said they “could smell ‘em before they could see ‘em.” It is an interesting factoid that the nickname and logo character was created in 1925, 3 years before Mickey Mouse arrived on the scene. Today, a few vintage motorcars are still used in winter, but most trains are pulled by steam or diesel engines as they travel through dense redwood forest, through deep mountain tunnels, and over many bridges and trestles. The Pudding Creek Express is a 1-hour, 7 mile round-trip excursion, turning at Glen Blair Junction. 299 E. Commercial St., Willits, (707) 964-6371. Year-round. $84/$109, 2-12 $42/$67, infants & dogs $10/$10. Reservations advised. 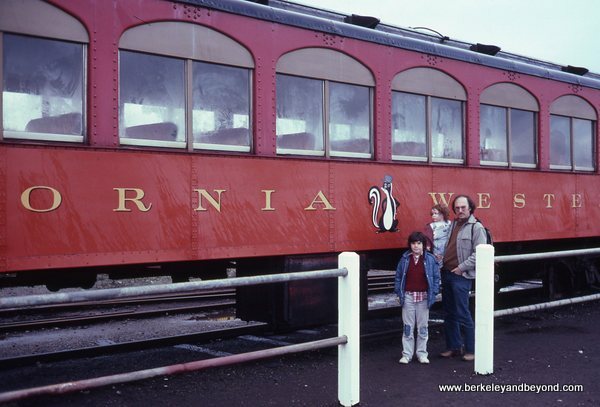 The Northspur Flyer makes a 40-mile, 4-hour round-trip to Northspur. The journey includes plenty of switchbacks, and you’ll go through a tunnel and see ancient groves of magnificent redwoods. A BBQ Dinner Excursion chugs along the same route, and traveling to remote Camp Noyo to spend the night camping is also an option. Muir Woods National Monument Off Hwy. 1, on Panoramic Hwy., 12 mi. N of San Francisco, in Muir Beach, (415) 388-2595. Daily 8-sunset. $10, under 16 free. No pets. 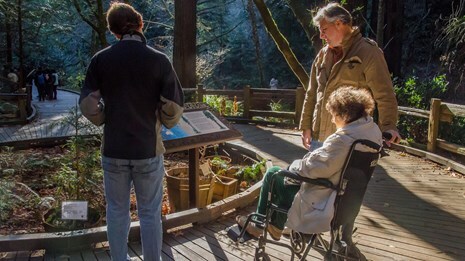 Located just off Highway 1 and enveloping 560 acres, this magnificent, fragrant old-growth redwood forest has 6 miles of level paved or boardwalk walking trails. The easy paved Main Trail loop has interpretive exhibits, and seven more-challenging unpaved trails lead away from the crowds. 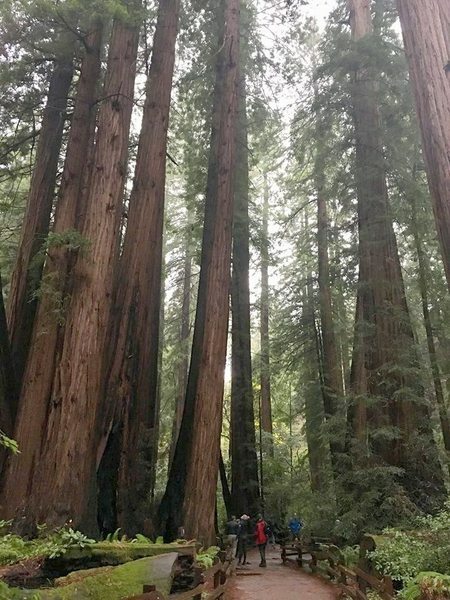 Naturalist John Muir, for whom the forest was named, said of it, "This is the best tree lover's monument that could be found in all the forests of the world." 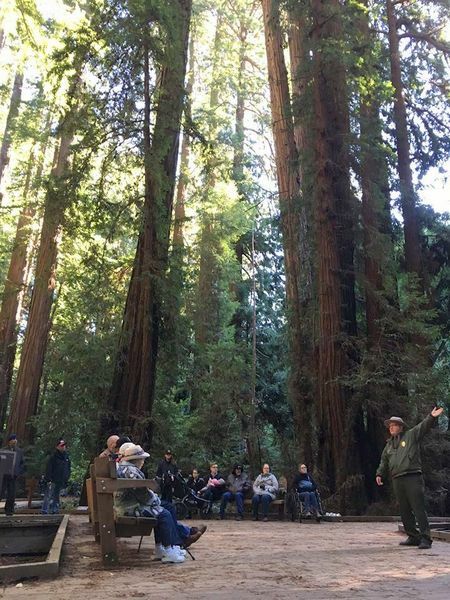 The largest tree here measures 240 feet high by 16 feet wide. Because nearly 1 million people come here each year, only a visit early or late in the day (before 10 a.m. or after 4 p.m.) provides the hope of some solitude; rainy days are also quiet. And no matter what time of year it is, visitors are advised to bring along warm wraps. The dense forest lets in very little sunlight, and the weather is usually damp, foggy, and cold. 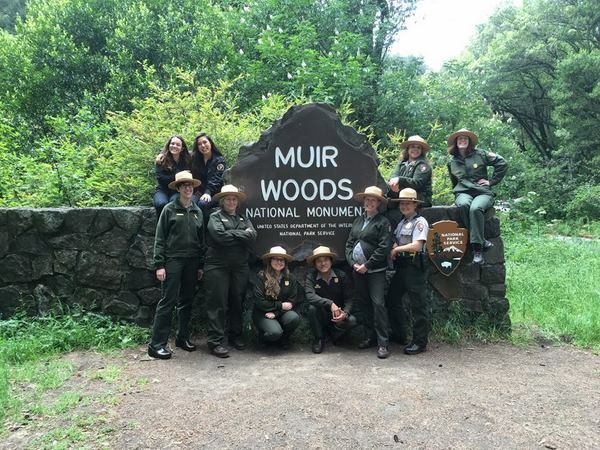 Children ages 6 through 12 can sign up for a free Junior Ranger program at the Visitors Center when they arrive and receive a sticker badge and workbook that helps them explore nature (download a booklet ahead of time). Picnicking is not permitted, but a simple cafe dispenses sustainable local foods. 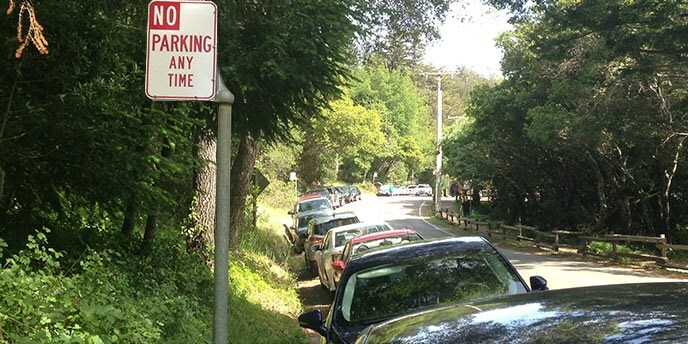 More things to do in Muir Beach. The Dorian 2001 Chestnut St./Fillmore St., Marina District, (415) 814-2671. D Tu-Sun, Sat-Sun Brunch. Anchoring the east end of busy Chestnut Street, The Dorian provides a comfortable and spacious interior. You can sit in the area surrounding the mega bar, where there are inviting half-moon booths and raised nooks, or you can move on in to the striking interior dining room with its high ceiling and gigantic chandelier plus booths, banquettes, and tables with posh velvet-covered chairs. I sat in a booth that provided me with a great view of the room and my dining partner with a great view of the street and bay beyond. We began our brunch with The Mimosa Experience, which consists of a bottle of sparkling wine plus three fruit juices (we chose passion fruit, pear, and classic orange); each additional bottle of sparkling wine that you order costs less. This was oodles of fun. Classic and creative cocktails are also available. We began brunch with a fragrant, gooey sticky pecan bun that reminded me of the ones my mother used to make sometimes as an after-school snack. and he chose a tasty wild-mushroom and goat-cheese frittata. Many diners here each choose a dish and share from the center of the table. Additional inviting items include a kale Caesar salad, lemon-ricotta pancakes, and spicy chorizo avocado toast. A burger with “fancy sauce” and more is also an option. Dinner brings on heftier dishes that also share well--a seafood tower; steak tartare with smoked quail egg, and a ribeye with bourbon steak sauce. More things to do in the Marina District.